At last, the first convention I could invite my future wife to! I was hoping that Rachel would have lots of fun and understand a bit more about the world of juggling that I am immersed in, and she did have a great time, so thanks to the organisers! Rachel lives in Leicester (ENGLAND), and I live in Stirling (SCOTLAND), so until we get married in November and she moves to Stirling, it is normally only for a few days every 3-4 weeks we can spend time together. The BJC was near Leicester, so I was able to head down early and spend a day with Rachel first. It was easy to know where to pitch my tent, as Graham and Britta’s Scottish and German flags could be seen from ages away! Britta had brought my Henrys Jazz diabolo which I lost during the tossup at the Scottish Juggling Convention! Most workshops, plus the canteen and Student Union were all approx 5mins walk from the main camping area. The walk became muddier and muddier as the weekend went on! Rach only brought long skirts, so she was caked in mud on the last day especially! 24hr Juggling tent seemed to be really dark most of the time, but we spent a fair amount of time doing a bit of practicing. Rach learned to juggle 3 rings and also learned some 3 ball tricks at a workshop which Britta ran. The Canteen was good, and the showers were excellent and always hot! The Student Union served fantastic and cheap food and hot drinks, but sadly due to staff illness, was only open on the first day 🙁 The Unicycle trials set up beside the campsite were fun to watch people messing around on! At the traders stalls, I had a game of Beach Flingo, and loved it so much that I bought some to sell in my online store! Spoke to Devilstick Peat about his Circus2Iraq adventure. Fantastic stuff, and you can visit the website to find out how to get involved or just to read the amazing stories. Excellent, enjoyable and very funny and entertaining. I learned loads of 2 ball tricks which I had never thought of before. Lots of easy ones, but quite a few astoundingly difficult ones chucked in also! Very inspiring lecture, which led to me writing several more pages of ideas, and resolving to step up several gears with my practice sessions! Very well taught. Far less complicated than last years risk matrix, which has been totally revised. Where better to go after learning about risk assessment, than to stick a nail up your nose! I plucked up the courage to have a go, and nearly managed it, but wimped out! Great fun to just watch other people do it though! Rounds of applause would happen everytime someone succeeded! They went on the renegade stage later that night and repeated their success and then got audience members to pull the nails back out again! A surprise workshop which just suddenly appeared on the workshop board, so I missed the first 20mins. It was worth every remaining minute though! 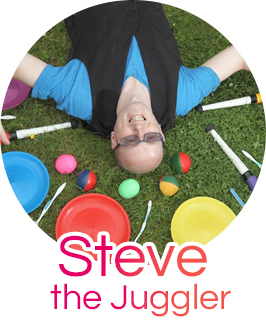 Not so much a juggling workshop, as a movement workshop. Things to do during your juggling routine. Ways to move your hands, feet, head, legs etc. Very inspiring. Circomedia’s first and second year students have got together to bring the BJC2004 an opening night spectacular, performing works generated in the last 6 months . Unfortunately, the comperes weren’t that good, and therefore inspired tons of hecklers (what do you expect when you dress a bloke up in a bunny girl outfit! ), and the heckles then carried on into the acts. Sitting on bales of hay, round a bonfire, listening to Pete Castle the storyteller telling tales of little boy Jack, 7 with one whack, why we should never pick our noses, the tailor with the fantastic coat. Enthralling stuff. We then toasted marshmallows on the bonfire. Due to the immense shower of rain in the build up to this event, most of the people who had came forward to put on a pre-Te Pooka fire show had opted out of performing, so this meant that there wasn’t as much of a build up to the big finale. Te-Pooka were fantastic. I have had the pleasure of meeting most of the team over recent months, so it was good to be watching people that I know. The glo-staff stuff was great, and they ended of course with the burning BJC logo. For some reason, I was absolutely knackered when it came to the first and third renegade, so I only caught the middle one which was compered by the fabulous Team Rootberry. Lasted over 3 hours. Rossi (poet) 10min rant against off road vehicles! A guy that did diabolo and slowly turned into Bruce Lee! A group of us played frisbee as we waited for the second lot of buses to pick us up to take us to Derby Market Place, where the games were to take place. Tim Foolery and Team Rootberry put on some good shows for the public, and there was Unicycle trials and Unicycle Hockey, before the games finally kicked off. There were team games this year, which required 5 people (and had to include a woman and a child). The team that won, consisted of 5 men though! I would have loved to have taken part, and I think in future years, they may call up everyone who wants to be in a team, and then pick teams randomly, so there are more people involved. New games included contact pyramid gladiators, and balloon modelling gladiators. See Juggling games page for further details on these and many more games. I lasted a while at Devilstick propellor gladiators, as this is a skill I have been practicing since last year. I won a game of gladiators at the end when people were playing just for fun! Unicycle gladiators was the highlight of the games, and the tossup was fun as always! The best juggling show I have ever seen! Fantastic theatre. Once again, people letting off balloons to try and get them caught in the grills on the ceiling! One seemed to attach itself to a light and begin burning though! Mad Pangea opened the show with their famous Bee Gee’s/Juggling routine. Max and Sue were awesome with a contact, juggling and aerial routine which was beautifully combined. Jay Gilligan was captivating. His anger and juggling just go so well together! Matt Hall had 2 routines. The hip-hop/breakdancing one was fantastic. The bus driver missed his turning on the way back to the campsite, and had to do a massive U-turn which generated a huge round of applause! It was a shame that more of the Stirling Juggling Project couldn’t be present, but as this is my 7th Convention, I am getting to know plenty of people, so there is always people to talk to. Workshops were excellent, and very inspiring, and the public show was the best one yet! Can’t wait till next years Convention in nearby Perth! A big thanks to the organisers who did a wonderful job.